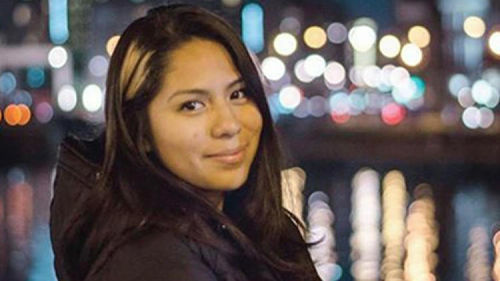 On a warm autumn evening in Paris, Nohemi Gonzalez was spending time with three friends at a local bistro, La Belle Equipe, when gunmen opened fire from a passing black vehicle. Gonzalez, a 23-year-old design student at Cal State Long Beach, had arrived in the city in September. She had never been out of the country and was looking forward to the semester abroad. In the sudden chaos, her friends managed to escape, but Gonzalez was fatally wounded, said Jeet Joshee, associate vice president for international education at the university. "She was seen being carried into an ambulance," and died of her injuries in a Paris hospital, Joshee said. Gonzalez was one of 19 people killed at the popular bistro. Nine others were critically wounded. From Bethlehem to Buenos Aires, the world is paying tribute to those killed in the Paris terrorism attacks. Many have marched and lighted candles in support of France, while several local governments have illuminated buildings in the colors of the French flag. The university will hold a vigil at 4 p.m. Sunday to mourn her death and to grieve for all of the victims of the attack. "Nohemi was an absolute delight," said David Teubner, a professor of design at Cal State Long Beach. "She was funny and warm and such a kind person.... She was involved in everything." A senior, Gonzalez had declared industrial design as her major, focusing on product development and production. In addition to her studies, she was a teaching assistant in the department and a shop technician, overseeing lower-division students on their design projects. She supported herself working at the Armani Exchange in Cerritos' Los Cerritos Center. "Nohemi was a very gifted student," said Martin Herman, chairman of the design department. "Her spirit and enthusiasm infused the department in so many ways. She had an indescribably sweet spirit and imagination. It's unbelievable that this could have happened." In a class assignment that required her to create a brand based on her identity, Gonzalez characterized herself and her background with confidence and pride. "I am Mexican American," she wrote, "and I also happen to be first generation born in the United States. I grew up in Whittier and had a very hard working mother that raised me to be extremely independent. If I had to describe myself in a few words I would say I am very high spirited, clean, orderly and self driven." A shining star in the department, Gonzalez — along with three other classmates — recently received second place in an international design competition. Their entry featured a biodegradable container that combined trail mix and a separate package of soil and seeds that could be grown in the container. In addition to Gonzalez's creativity, Teubner said, she had an instinctual confidence about her work. "She would hide her projects from me because she didn't want me to change them." She and three classmates from the Department of Design were excited to be studying at Strate School of Design in Paris. In an email to Teubner, Gonzalez wrote, "I'm actually loving the semester here. I mean, besides that everything is in French...."
"She was ready for new inspiration, ready to experience a new culture," said Pamela Bee, who worked as operations coordinator for the department. "We knew we would not see her for a semester, but we knew she would come back and help her fellow classmates get on with their projects." She was always doing more than she needed to, said Bee, who recalled that Gonzalez had brought in homemade pozole for the department over the summer. Bee recounted how Gonzalez was raised by her mother, who worked as a hairdresser, and that Gonzalez would often come to school with "cool, funky hair that her mom did." The two were last in touch on Wednesday, on Facebook. “She was very strong, very committed to whatever she decided to do,” Beatrez Gonzalez said. Gonzalez met her boyfriend, Tim Mraz, at the university. Mraz graduated last year, according to Bee. "They were such a wonderful couple," Bee said. "She cared for him, and he respected her." Mraz declined to comment for this report but posted his feelings on Instagram. "Yesterday I lost the most important person in my life," he wrote. "She was my best friend and she will always be my angel forever. I am lost for words. My prayers are with her family. Such a bright soul and the sweetest girl with a smile on her face." He included a photo of the two embracing. Weeks earlier, he had sent her birthday wishes and mentioned that they would see each other in December. "I've missed you so much and I wish I could be with you to celebrate in Paris." Many of Gonzalez's friends took to Facebook to express their grief. "It crushes my soul that you're gone but you were off being a free spirit like you've always been. I love you so much and cherish all the memories we've shared together," Madeline Chavez wrote. University President Jane Close Conoley said the school was deeply saddened by Gonzalez's death. "Our thoughts and prayers are with her family and friends during this sad time," she said in a statement. 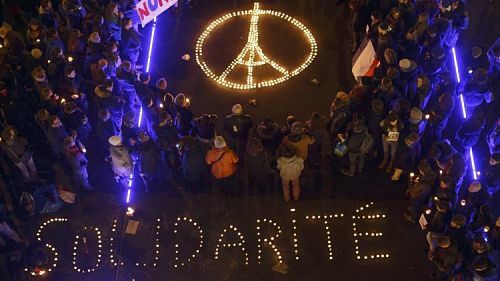 "Our university stands with our nearly eighty foreign exchange students from France as they struggle with this tragedy. We will extend all support necessary to comfort them." In her branding assignment, Gonzalez had created a logo for herself that featured an arrowhead. It was important to her because, as she wrote, "when life is dragging you back with difficulties, it means it's going to launch you into something great. So just focus and keep aiming."